Media and Communications Officer of the Special Task Force, also known as ‘Operation Safe Haven’, Capt. Ikedichi Iweha, has said that one person was killed and several others injured in Jos as rival Muslim youths clashed with members of the Shi’ite movement who had protested the continued detention of their leader, Sheik Ibrahim El-Zakzaky. Subsequently, Iweha said that the Commander of the task force, Maj. Gen. Tagbo Udeh, has ordered a ban on all forms of processions and rallies in the state, adding that such rallies or processions must get the permission of the police. They had also demanded the corpses of their members who were allegedly killed by the soldiers for proper burial according to Islamic tradition. Iweha told Punch, in an interview in Jos on Sunday, that many members of the movement were also arrested when the otherwise peaceful procession turned violent at Bauchi road, leading to the death of one person. He said the incident had created tension around Bauchi Road, Rikkos, Angwan Rogo, Dilimi, Nasarawa, Gwom and many other Hausa-dominated areas, leading to a clash between some rival Muslim sects. He said that the timely intervention of security operatives saved what would have been a very ugly situation, stressing that the commander had also ordered an all-round patrol and surveillance by operatives of the task force. The media officer said that many of those arrested were being interrogated to ascertain their level of culpability in the incident, adding that at the end of the interrogation those found innocent would be released. 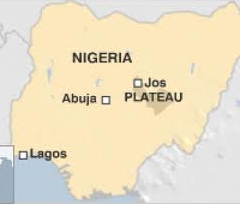 On Sunday, STF rolled out tanks at strategic places in the metropolis, while there were heavy security presence around virtually all the churches and other worship centres in Jos and its environs. The security men were dressed in combat uniforms a situation that raised curiosity around Jos metropolis. Iweha said, “The procession by the women later turned violent as rival Muslim youths clashed along Bauchi Road as the Shi’ite members were proceeding to the Central Mosque and the commander has ordered a round-the-clock security surveillance and patrol and we would not want to take chances. He said that the incident had been contained while security agencies had been placed on red alert to avoid further breakdown of law and order in the metropolis.